In April 2015 the Gideons announced that they had given away their two billionth Bible. The American Bible Society probably isn’t far behind. I don’t doubt, moreover, that the Bible is the best selling book of all time, as is often claimed; it’s also been translated into more than 2,000 languages. So a lot of people on the planet own the Bible. But how many of them read it? No matter how it has reached so many people, most of its owners don’t find it a page-turner. It’s probably the least read best seller of all time. Believers know they ‘ought’ to read it—but, no doubt about it, it’s a chore. They are stumped by so much of what made it into the canon. It doesn’t feel like God’s Word. Shouldn’t it be the best stuff ever? Indeed, scripture can harmful to piety. Hence some Bible readers, when they come across the despicable parts, naively run to their pastors or priests to be rescued from shock and doubt. These paid propagandists, who are masters of slick apologetics, offer doubt-deflecting excuses. May I make a suggestion? Spurn the canned excuses; forget the priest or pastor if you really want to know why the Bible is so alien and troublesome. Turn instead to non-religious experts on the scriptures. They are not obliged to follow the party line. Peter Boghossian has said, “Doubt is your intellectual conscience pleading with you to be honest with yourself.” Don’t let religious professionals suppress the honesty instinct. 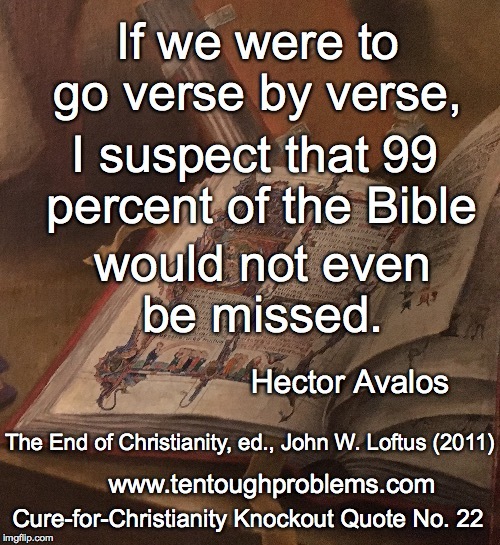 This title alone should snap believers to attention: “Why Biblical Studies Must End.” Hector Avalos wrote a book by that title, and an excerpt from the book is included in John W. Loftus’s 2011 anthology, The End of Christianity. If you want to know why you can stop reading the Bible, and why scholars can stop devoting careers to analyzing every last syllable of it, spend a couple of hours studying this essay. Avalos describes half a dozen subdisciplines of Biblical Studies, showing pretty convincingly that the field has outlived its usefulness. His essay is a handy tutorial, with abundant footnotes to guide further study. In the essay Avalos discusses (1) translation; (2) textual criticism; (3) biblical history & archaeology; (4) historical Jesus studies; (5) literary criticism, and (6) biblical theology. Chances are, most Christians have never given much thought to these categories, so it’s no surprise that they don’t have the tools to challenge the superstition that the Bible is the Word of God. There are so many different translations of the Bible because scholars and theologians disagree, especially about how best to nuance embarrassing texts when rendering them into a modern tongue. They will be coming up with new translations forever—what’s the point? Can it be true that Avalos’s 99-percent-wouldn’t-be-missed rule applies to the gospels too? Surely not, since, for most Christians, these are the most treasured books of the Bible. But sorry, by standards of historical reliability—as opposed to sentimental appeal—the gospels are woefully deficient. Christians may be annoyed by Jesus mythicists, but mythicism is the least of their worries. In this major section of the essay, Avalos points out that no sound methodology has yet been identified to clarify who Jesus was. How can gospel fiction be separated from gospel fact? We cannot point to any specific story with any assurance whatever that it is based eyewitness accounts, oral tradition, or super-reliable memory mechanisms. Avalos draws attention to the famous Jesus Seminar, scholars who thought they had identified criteria for nailing down the authentic deeds and saying of Jesus. But they were operating on their own preconceptions of Jesus. The Christians who lovingly thumb through the gospels have no clue that their beloved Jesus is an illusion; in fact, he cannot be found. “The quest for the historical Jesus,” Avalos says, “is an abject failure. Further progress is futile because we simply don’t have any preserved accounts of Jesus from his time or from any proven eyewitnesses.” Avalos delivers even more bad news with his book, The Bad Jesus: the Ethics of New Testament Ethics (2015). One of the early lessons I absorbed in seminary was that a “theology of the Bible” is impossible, because its ideas of God are so contradictory—and too often downright horrible. But—what a surprise—theologians have worked a way around this. Avalos notes that Krister Stendahl, one-time dean of Harvard Divinity School, argued for a distinction between what a Bible text meant originally and what it can mean today. This, of course, gives theologians permission to do what they do best, i.e., make things up to suit their own sensibilities, which laypeople have always done anyway. Other Hector Avalos titles worth pursuing include, Fighting Words: The Origins of Religious Violence (2005) and Slavery, Abolitionism, and the Ethics of Biblical Scholarship (2013).